No revelations here--just some awkward shots of narrow closets, circa 1950. Each of our houses has required its own clothing system. You've already seen my attempt at glamorous clothing storage. My kids don't use dressers, either. It helps that we don't keep other stuff in the closets. Today we moved Elise's folded clothes from the bookcase to the shelves up high. Can you guess why? Baskets hold tights and pajamas; dresses hang on a small rod to the right. I do have hand-me-downs and yard sale clothes for Elise: sizes 2, 3, and 4 each in their own Ziploc Big Bags . They can squeeze into the small space under her bedrails. 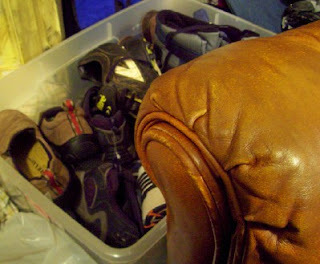 I keep two bins in Andrew's closet, one for shoes in the next few sizes and one for clothes. He grows so fast that I don't have so many hand-me-downs to store. Each season we pull them down and see what fits. Outgrown clothes are given to friends or Freecycled. I no longer hang his clothing by complete outfits. In this closet, clothes for each day fit in my sister's old organizer. Above, my husband's frugal work wardrobe, courtesy Goodwill and Salvation Army. His shoulders are so broad that we can barely close the door on his shirts! He mounted an ultra-high rod to double the space and uses a yard sale dresser for everyday knits. Tomorrow we'll tackle the tools of hospitality--dishes, baskets, and the like. I'm even boring myself with this series! In the meantime, if you have specific questions related to clothing storage, I'll do my best to answer them in the comments below. No, no, no, this is not boring! It's great to see how you organize your home, and so timely as so many of us want to get things in order in the new year. Thanks! My husband has very broad shoulders too, and he loves to shop at the thrift store, but unfortunately you can't try things on there. Do you have any suggestions for finding clothes that fit? Brands that your husband likes? Our elementary school has a great spring consignment sale and I may hit it up for bows. My oldest is now into headbands. My youngest won't keep a bow in her hair! 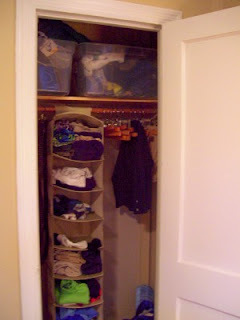 When we moved into our house, there was a little "extra" closet in the master bedroom with a couple shelves. My husband has the "real" closet, and my dad was kind enough to install two rods in the little one for me (instead of the handful of shelves). The top is shirts and the bottom is skirts. It's perfect! You're not boring me. :) I'm really enjoying this series! This isn't boring stuff at all. 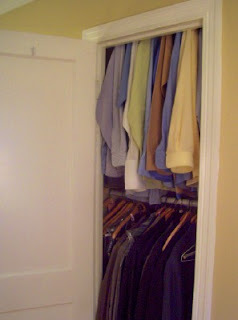 In fact, I've been meaning to tackle my closets for months now and you've now just inspired me to weed through clothes! Does Elise wear pants or only dresses? If she does wear pants and overalls, where do you keep them and her tops and onesies? Also where are her shoes, sweaters, coats, hats,bibs? Are her diapers kept on the changing table? It just seems since she is so young (and we all there are messes and accidents at her age),she must need a lot of changes of clothes. Or maybe we should just learn to live with less and do laundry more often! Thanks for all your tips - many of which I use. You're series is inspiring. Keep it up! Jaime, I ordered an initial set of small clip bows from Amy of Momadvice, whose prices and quality were great. Beyond that, I've been lucky to find a few grab bags of big bows at yard sales and one thrift store. I'm willing to disinfect and experiment with prices like $1/bag! I guess we're lucky, because most of our thrift stores have changing rooms. Otherwise, my husband will slip something over his shirt to see if the arms have shrunk up. Shrinkage seems to be the #1 problem with buying men's cotton dress shirts secondhand. Even if the tag has a size, the shirt may no longer be that size. If you are handy with a tape measure, you can bring the exact measurements from a shirt which fits him well and compare those against secondhand shirts. My husband wears an 18 1/2 neck and 37 inch sleeves--and a jacket in 52 long. I get excited whenever I find suits with labels from a Big and Tall store in the lining. We also like the Dillard's big and tall shirts which go on clearance at the end the season for as little as $12. What you see is what you get! Elise has mostly dresses, with some pants/shirt combos which I hang together with the dresses, on the right. Her pajamas are in the basket. I really don't have onesies, because all the clothes she has are sorted into specific outfits. For instance, she has a white eyelet onesie that goes with a pair of blue velour pants and a blue knit sweater. I keep it all hung together on one hanger. Extra diapers are on the closet shelf up high, after she learned to pull them from the bookshelf and throw them all over the floor. She doesn't have a changing table. I keep a pretty blanket across the foot of the double (guest) bed in her room for changing, or else I do it in the breakfast room where I have an additional stack of diapers on the shoe bench. Her main coat is in the shoe bench in the kitchen for easy access. Her dress coat is in the small hallway coat closet. Her hats and everyday shoes (2 pairs) are in the kitchen shoe bench, with fancier and off-season shoes in a tote bag on her closet shelf. Bibs I keep in a kitchen drawer near her booster chair. My philosophy is to keep things close to where you use them! I am really enjoying this series Meredith. While home styles differ making some ideas hard for me to use, the overall idea is so helpful. I'm inspired by your organization to try and get my home on-board too! This isn't the slightest bit boring! You're a genius when it comes to storing things and making it all visually appealing. Thanks for sharing! I love seeing how others organize things. Each time I have a new baby, I have to reassign drawers and closet space in a big reorganization, and I do a smaller scale reorganization each time I change out the seasonal clothes. I can always use new ideas--especially ones that are "thinking outside of the box." I have a lot of specific organizing projects planned in the coming months, so keep the ideas and inspiration coming. I have recently found your blog while looking for grocery outlets. I love it!!! Not only are your posts inspiring so are all the great links I have found from thr Frugal Hacker Icon!! Thank you!!!! 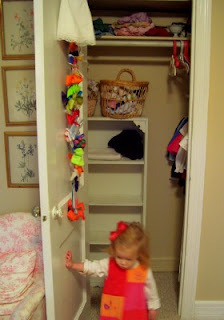 I was searching for closet storage ideas for number 2 comeing soon when I remembered your blog. I decided to come back and check in on some old storage posts. 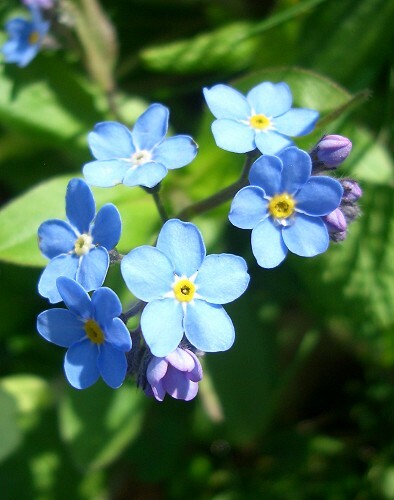 I just wanted to say I miss you and I hope all is well. Thank you!!! !